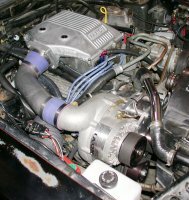 Paxton 1985 302 Carbureted Mustang System Satin  : Supercharger Superstore, Your Online Source for Vortech Superchargers, Paxton Superchargers, Procharger Superchargers, Magnacharger Superchargers and Techco Superchargers! This system is designed for factory serpentine accessory drive. It allows retention of all engine accessories. Call Paxton prior to placing order to confirm fit and suggested accessories.